Whilst wandering about the neighbourhood on various errands I stumbled across this little motor. A classic British Mini with go faster stripes thus qualifying as a line themed shot, not at all what I had in mind for today. It was quite hard to get a good angle as it was parked tight to another car and the background was quite fussy so I played around with the image on Picnik a bit. 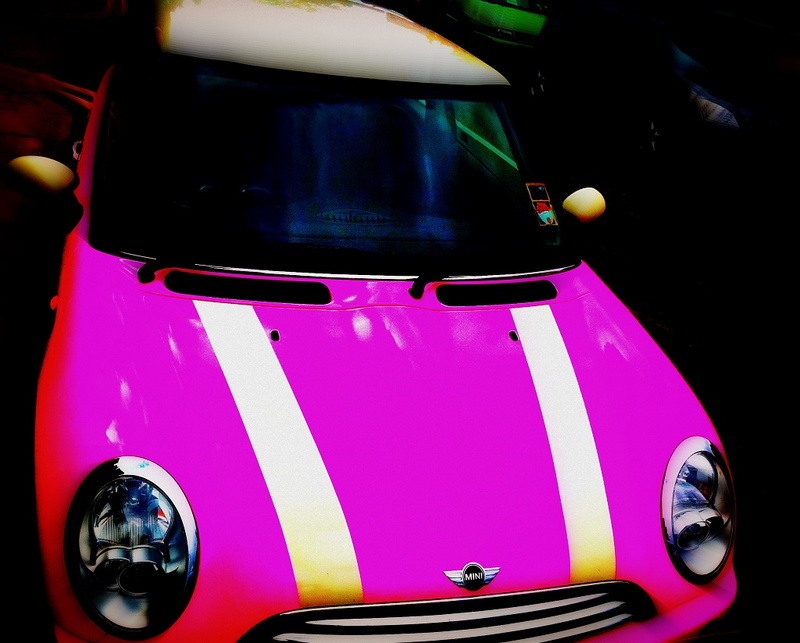 @clarissajohal Yes it was pink I just did a bit of this and that editing wise. hahaha. See my "not exactly Quadrophenia", a pink scooter!! Oh wow, this is my perfect car! I just love those cars. I had one in '77 when I was in Paris. I recall coming to the States and raving about how wonderful it was. No one had heard of them here yet, everyone was in to big cars and they thought I crazy. After all, why would anyone want anything so small? I had an MG and a Fiat - the Mini seemed big to me! Someone's got a smart and snazzy ride! What fun to see a local car from your neck of the woods! That is a very cool shot and car. Is that a mini cooper? luv the color! pink rocks mi socks! Awesome shot, man. I like the result of the processing. Oooh every girl's dream! Where was this again?? lol A great shot, good angle and great processing. pink has never been a favorite color of mine but i'm liking it here. who would've thought something so girly can look so good? nice car and great shot. this is so cool! I love pink (almost as much as purple) and those lines make it a wonderful entry for the theme!